 Most Recent Post: Friday, December 9, 2011, at 10:10 a.m. If you've seen my on the forums, chances are you've seen me rant about this. It's my favorite score of all time. I can't help it. 2. The Empire Strikes Back – John Williams (Better in every way than The New Hope, sorry guys. Vader's theme is just too delicious to pass up. But the real gem is the Han/Leia love theme. During the 20 minute finale, I can literally follow EXACTLY what's happening on screen in my head. It is a wonderful, very rewarding experience. A PERFECT score.) As far as the rest of the saga goes, Phantom Menace and Revenge of the Sith are the two I rarely come back to. I'd probably rank them Empire > A New Hope >= Return of the Jedi > Attack of the Clones (my favorite prequel score by far. That love theme, man!) > Phantom Menace > ROTS. 6.E.T. 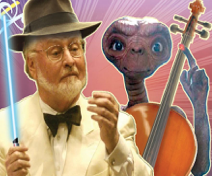 the Extraterrestrial - John Williams. Besides Empire, this is my favorite Williams score and also my favorite Spielberg movie. Something about the childish theme fascinates me. 7. Ben-Hur: A Tale of the Christ - Miklos Rozsa. I was recently exposed to this one in the last few years and it absolutely blew me away. Within a year, it rose to my top 5 favorite scores of all time. Ben-Hur is simply unmatched. 8.CutThroat Island - John Debnay. This one doesn't need much of an explanation. It's the best Pirate music there is! 9. Close Encounters of the Third Kind - John Williams. I know that most of the score is dissonant and underplayed, but DUDE. The finale for Close Encounters simply blows everything else out of the water. It's unmatched in sheer emotion, mystique, and pure beauty. 10. Dinotopia - Trevor Jones. I'm surprised this one actually made my top 10. But every time I go back to it I like it more. Dinotopia is exactly what I love. Sweeping, thematic, childhood nostalgia, and dinosaur-related. But mostly childhood nostalgia..
11.Conan the Barbarian - Poledouris. I only have the re-recording, but it is glorious. 12.The Hobbit - Howard Shore. Currently Desolation of Smaug is my favorite, but as of writing this, the third one isn't out yet. EDIT: BOFA is out. Desolation of Smaug is still my favorite of the three, but they are all stellar. 13.The Prince of Egypt - Hans Zimmer. My favorite Zimmer score and musical. 14.Pirates of the Caribbean: At World's End - Hans Zimmer. My other favorite Zimmer score. The love theme is gorgeous, and the overall sense of largeness and adventure and piratry is unlike anything else that we'll ever hear, most likely. 15.Krull - James Horner. Krull is my favorite version of Horner. A little expiremental, massive action, and a tortured love theme. Note: This score works absolutely hideously in the context of the film. 16.Lady in the Water - James Newton Howard. Used to be in my top 5. Definitely still one of my favorite scores. One of the first 5 star scores I ever purchased on blind impulse. JNH is perfect here. So much harmonic beauty. 17.Star Trek: The Motion Picture - Jerry Goldsmith. This one is something special, but I think that some of the more Goldsmith-Inclined scoreboard members could explain it better than me, so just go read CC's review. 18.How to Train Your Dragon - Powell. Ok, Edmund, I told you it would make my top 25. This score floats right up there with the animated Horner scores of the 90's. It's epic, large, thematic, and friendly all at the same time. Took me awhile to get into, but it's definitely one of the best animated scores ever. 19.Amazing Spider-Man - James Horner. My favorite superhero + my favorite composer = this wonderful score! 20. Journey 2: The Mysterious Island - Andrew Lockington. I love this guy. I've been following him since I saw City of Ember in 2008 (before it was cool, yo.) I'd rank Journey 2 slightly above City of Ember. Both of them are stellar action/adventure scores. 21. War Horse - John Williams. This is my favorite sound. The sweeping romantic string sound. If you haven't noticed. 22. Titanic - James Horner. This was technically my first score that I ever owned. In 5th grade (elementary school) we had silent reading time, and my teacher would always put in the Titanic CD while we read. I had recently gotten my first iPod, and I was trying a bunch of music genres but I couldn't find anything I liked besides video game MIDI files from the internet. Anyways, I summoned up the courage to ask my teacher to borrow the Titanic CD, and I burned it and put it on my iPod. In fifth grade. It was my only album for about a year. I would always read while listening to it. Basically, James Horner had a profound influence on who I am and what I love. 23. Atlantis: The Lost Empire - James Newton Howard. JNH's strongest animated effort. This was also one of the first scores I've ever purchased. Also, in middle school band, we played "The Submarine" and I screwed up the oboe part pretty badly so the whole band had to start again. Great score, though. 24. Halo 3 - Marty O'Donnell and Michael Salvatori. Ok, first game score on the list. The Halo series profoundly influenced my tastes when I was younger, and Halo 3 is the best of the bunch. These guys are absolutely phenomenal, and I hope Marty gets some awesome new projects now that he's fired from Bungie. Also, You'll probably hear me ranting about Destiny in about a month when that is released. I can't stand Doyle's Potter score, and I don't really like Doyle in general. EDIT: Four years later. I still don't like it much. I'm getting a little sick of Elfman. EDIT: I'm getting REALLY sick of Elfman. Post-Lost Giacchino repeats himself so much more than Horner. I'm sick of it! Lockington is the greatest upcoming composer! I absolutely can't stand the track title “Vernian's Beleive” because of that god awful apostrophe. WHY DID YOU PUT THAT THERE!!!!!!!!!!!! At World's End is one of the greatest scores in this decade. And parts of it ARE swashbuckling. The Matrix Scores are nearly as good and as memorable as LOTR and Star Wars. Even though they aren't super leitmotific, they have an incredibly distinct and thought-out style. I adore Desplat's Potter scores. I'd say that Prisoner of Azkaban and Deathly Hallows part 2 are the best of the series. I also appreciate the Hooper scores more than most, and I regularly listen to Order of the Phoenix. A theme in Horner's Spider-Man sounds very similar to Elfman's. John Williams rips off of Korngold in Hook. Horner does the same exact rip in Casper, and then Debnay does it in CutThroat. In Star Wars: Knights of the Old Republic, the composers reference the Imperial March and Khan's theme in the same cue! I regularly communicate with Giacchino's lead orchestrator, Chad Seiter. I listen to some classical, and I especially enjoy Prokofiev, Tchaikovsky, and Rachmaninoff. I own about 30 random classical albums. My favorites are the ballets like The Nutcracker and Romeo and Juliet. I also listen to Symphonic Metal! It's very similar to film scores, although a bit heavier. I'm really enjoying it, and I own about 15 metal albums at this point.